I was searching on Pinterest recently for ideas for scrap fabric. This idea was by far my favorite. I simply untwisted a wire hanger with pliers. Then smoothed the corners and shaped into smallish circle. I dug through all my bags of scrap fabric for spring colors. I had a lot of thin yellow that I never saw myself using. I used the yellow as a base. I folded scraps in half and looped then around the wire, pulling tight. I filled the entire wire with the yellow, it was not full looking though. Then I started with the brights and patterns. Making sure that I spaced similar colors evenly around until the wreath looked full. I then tied a long length of ribbon so it can be hung. Finally a bow to add a focal point. 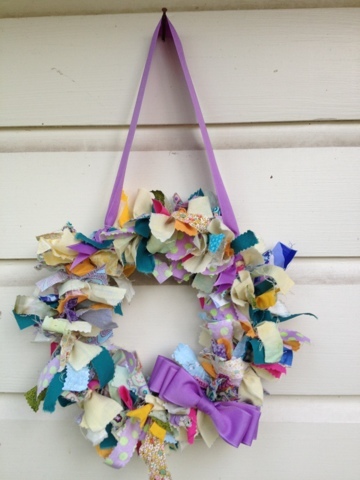 This project was so satisfying , using my scraps, making a gift for free, getting to sit in front of the tv while making it and my mama's love when I gave it to her. I had a bunch of washcloths. They were rather thin. I made hot pad/ kitchen rag things for camping. Not pictured. 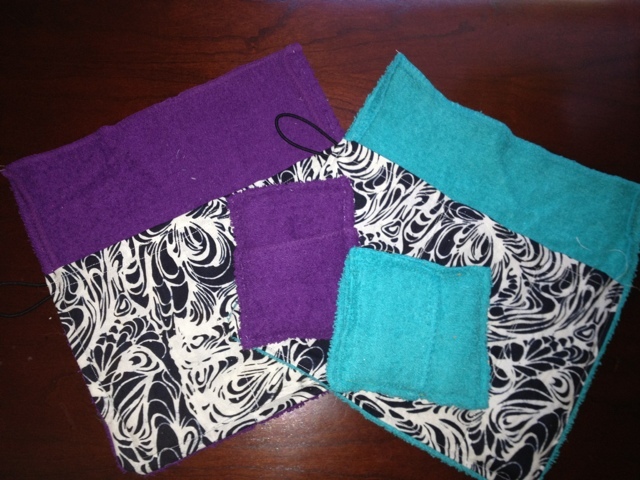 I saw on Pinterest where the washcloth soap holder/ saver had been made. Then I decided to make toothbrush covers. These are easy to throw in the wash after a few days of use rather than gross plastic tube. I I am not a big fan of plastic. I basically cut a fat quarter in half long ways. I then folded over along the folded edge i sewed a border. Then sewed along three edges with the washcloth and hair tie pinned down. I made a pocket. I flipped the pocket a stitched again around the three edges. I had two great aunts that never had children. When they passed, all of their fun stuff came to my sister and I. I have held on a lot of their stuff for awhile. I enjoyed getting them out and thinking of the things I could make from them. Ive had this huge box of jewelry for 7 years, unfortunately, it hasn't made its way into a project yet. I am moving across the country and I need to pack everything up, or get rid of it. Its hard to think about getting rid of some stuff. I have had one yard sale and we sold mostly old jewelry that was from the 40's and 50's. These earrings were sold. I miss them, its hard and ridiculous that I miss them. I wish I wasn't materialistic. I love my junk, especially the stuff my great aunts sparkles. Ive been craving water and to float. 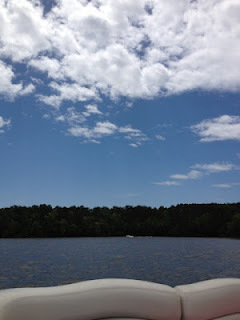 We got out on the lake in the boat last weekend. It was bittersweet, i was in heaven in the water, but sad to be leave my home and family here. I've been going to the lake with my dad since I was little. We never do much more than float. Iam a water/ air sign and feel very connected to water. I always crave it this time if year. The ocean is a great fix. A lake is awesome when it is calm and few folks were out because the water is cold still. This is Lake Tillery, NC. My grandmother fell in her home a few months ago. 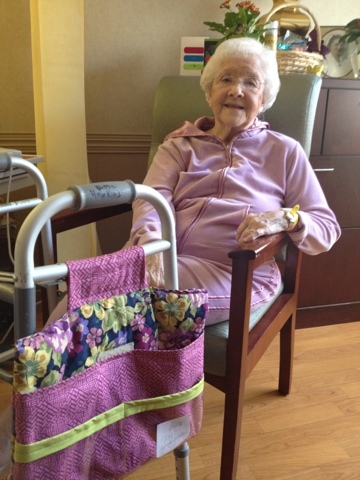 She is in a rehab facility and will be going home soon. She will need to use her walker at home, so I made her pockets for the walker and gave them to her for Easter. She seemed very pleased. I wasnt able to measure it myself, I think I'll make it a bit smaller if I ever do this again. I used heavy cotton and canvas and clear plastic for the pockets so she could see what was in the pockets. It took me abt 3 hours to make and it didn't cost me a thing, all from my stash. I loved making this. 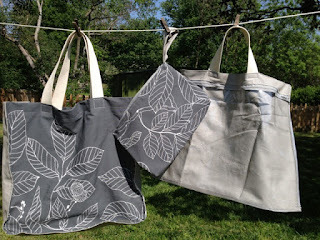 Check out the set of three canvas bags and plastic travel bags I made for myself! I love them I am making more soon.